Strip heaters, often known as component heaters, are a simple way of using surface area to transfer heat effectively. 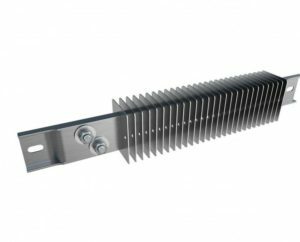 Steel strip heaters are an excellent industrial heating product and can be easily controlled by using a temperature controller such as a mechanical thermostat or a cost effective bimetal thermostats that can be installed on the surface you are heating. Mounting holes are useful to mount the process heaters securely on almost any surface with terminal extending from the sheath for easy electrical connections. Many users also request lead wires that extend from one end that make the installation more flexible as the temperature control panel is easily adaptable to this configuration. Use insulators if a limited mounting space is ½” longer than the strip heater. WATTCO™ strip heater mounting tabs are punched prior to insulator installation. WATTCO™ perforated brass bus bar are solid conductors to connect several strip heaters in series or parallel. For higher current-carrying capacities, all WATTCO™ bus bars can be specially configured to meet your requirements. For CPS strip heaters: • Terminal box is supplied with BX cable fitting • Terminal box is mounted in any of the four directions according to your requirements. Use heavy-gauge, nickel-plated steel clamps for mounting WATTCO™ strip heaters to large surfaces (tank walls, platens, dies). Weld, braze or thread threaded 3/8” diameter studs into the work areas. Use ceramic post terminal covers for: • Heaters with standard 10-32 threaded terminals at both ends • Heaters with offset terminals at one end Also use ceramic post terminal with insulated wiring in order to be electrical shock proof.